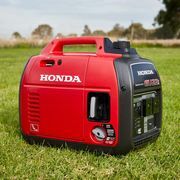 THIS IS A TWIN PACKAGE DEAL MEANING YOU GET: 2 x Generators (RRP $2,099 each) 2 x Genuine Honda Covers (RRP $90 each) 2 x Genuine Honda Security Cable (RRP $25 each) 2 x 1L Bottle of oil (RRP $15 each) 2 x 12V Battery charging cables 1 x Parallel connecting cable (RRP $100) +FREE DELIVERY (valued at $50) RRP of entire package deal: $4,609 inc. gst. YOUR PRICE: $3,769 inc. gst SAVING OF $840! Well its finally here! 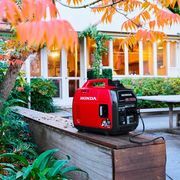 The all new Honda EU22i which is superseding the EU20i building on the legacy that it has left behind as Australias most dependable leisure generator. 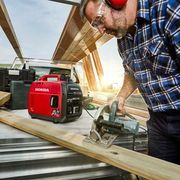 A new model means new features and vast improvements but what you would love to know is that its still the same reliable generator you have come to know and love just supercharged, and lets be honest everyone loves more power! The electricity this generator produces is better quality then that produced commercially. 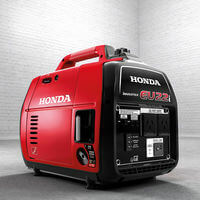 Meaning that high quality products with circuit boards can be plugged straight into the generator! The new improvements include 200W more power than before which is what everyone has been asking for! As we have moved further into the future our demands for power on the move have got larger and this new improvement accommodates that need. For anyone that has changed the oil in the previous model or attempted to fill it up they will understand when I say it wasn't the easiest task on your "to do list". Thats why the new model has improved oil access to remove this headache from your every day life. An additional feature that also removes a substantial issue is stale fuel in the carburettor bowl. 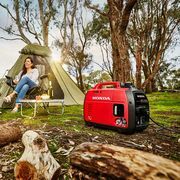 Camping is a seasonal activity and often the EU20i generator would spend months tucked away in the shed without use! You may empty the fuel tank but the fuel sitting in the system is left there. This lead to carby issues and starting problems caused by the stale fuel. Now, they have a run dry element on the switch which clears the complete unit of fuel so that it none is left in the units system when the generator needs to be stored. Now thats an absolute game changer! A smaller improvement also includes an upgraded recoil starter that has a rope guard to improve its strength, and a rubber grip for comfort. Don't worry, this EU22i still maintains Honda's forever dependable 4-stroke technology, the eco-throttle for improved efficiency, oil alert, 12V battery charging cables and parallel connection ports! As per usual you get a 4yr dealer wide domestic use warranty!! Our extras are GENUINE HONDA! Not cheap replicas!